Copyright (c) – Poptones Ltd. Released with a printed lyrics/credits sheet. All tracks produced, engineered and mixed at C Sharp Studios, Glasgow. ℗ Cosmic Rough Riders. © Poptones Ltd 2000. Matrix / Runout (Runout side A, etched): Mc5 015LP A¹ A PORKY PRIME CUT. It is clear from the band's name, the album's title and even the sleeve/label graphic design that this album aspires to psychedelia. In reality, however, ...Melodic Sunshine is like nothing so much as laid-back 1970s California soft-rock in the vein of Seals & Croft, The Eagles and America. That's not necessarily bad, as this is a sound that (unlike many others from the same period) doesn't often get revisited by newer bands. It is a bland, inoffensive and often pleasant music. 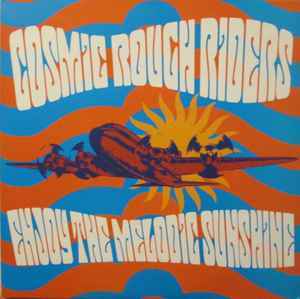 In this style's heyday, Cosmic Rough Riders would have gone unnoticed, or perhaps offered up a hit single and been otherwise forgotten. As it stands, this is a sweet album and the only one like it in this writer's audio library, but it's not anything I need more of.